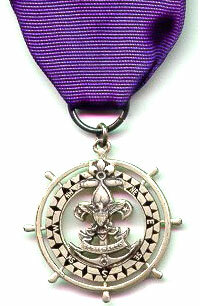 The Quartermaster Award is the highest award in the Sea Scouting Program. In order to earn Quartermaster Award, Sea Scouts must show nautical proficiency, leadership, and service over a period of time; earn several rating awards; and pass a Board of Review at the local Council level. This is a rare award. There are two versions of the Quartermaster Award knot, as shown above. The patch with a white background, is worn on the dress whites, and the one with the black background, is worn on the New Century uniform. For the requirements, Click Here, or see the Seascout.org advancement pages.